It’s an exciting time in DeSoto for the Suncoast Campaign for Grade-Level Reading. In January, the county officially became a Campaign for Grade-Level Reading community. United Way Suncoast is serving as the lead agency working alongside the School District of DeSoto County, the DeSoto County Health Department, the DeSoto County Education Foundation, and the Early Learning Coalition of Florida’s Heartland to implement the campaign. There has already been a variety of activities and programs aimed at helping to get DeSoto students reading on grade level by third grade. Some of these programs include the Attendance Awareness Poster Contest, the Suncoast Summer Reading Challenge, and the distribution of Kindergarten Readiness Bags. Among the resources for grade level reading is the DeSoto County School District’s new Bookmobile. The school district recently transformed a school bus into a literacy building tool on wheels. Engagement team members with the Suncoast Campaign for Grade-Level Reading joined the school district for the rollout of the brand new Bookmobile at the DeSoto County Fair. The Bookmobile will be utilized throughout the community to provide vital resources for the students and families in DeSoto County. According to the School District of DeSoto County, the primary goal of the bus is to help children be successful with reading every day and not just for a test. The district recognizes that many students struggle with reading due to a lack of vocabulary and background knowledge. 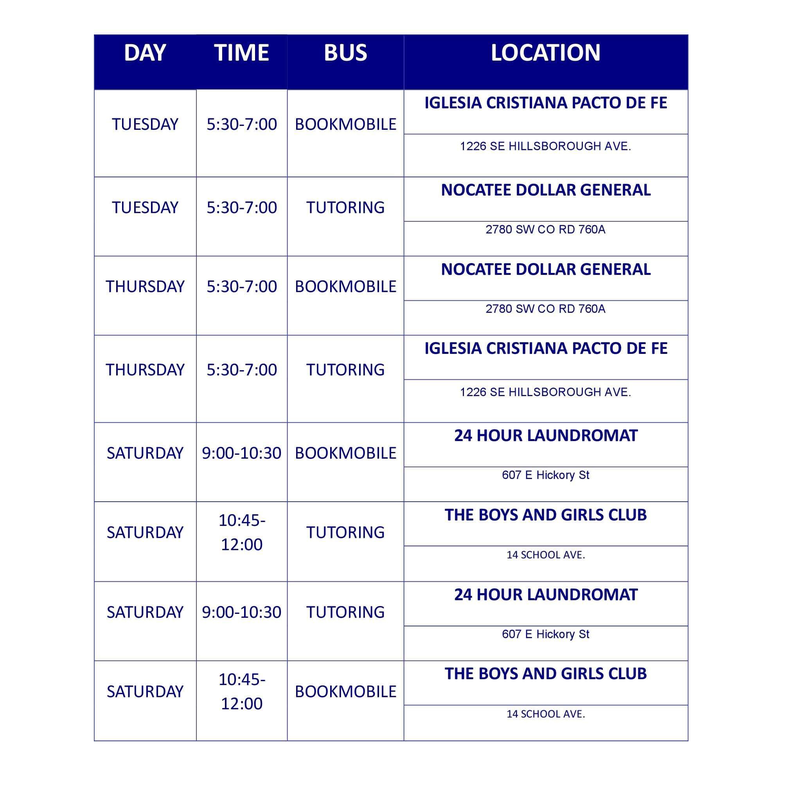 The Bookmobile aims to build essential skills for these students while also providing parents with important information and assistance that will be beneficial for strengthening literacy skills at home as they become an active part of their child’s learning. The Suncoast Campaign for Grade-Level Reading is a communitywide effort in Charlotte, DeSoto Manatee, and Sarasota counties to help all children, especially those from low-income families, succeed in school and life by ensuring they read on grade level by the end of third grade. The campaign seeks to increase the number of children reading proficiently by the end of third grade, a key indicator of lifelong outcomes such as high school graduation rates. For more information, please visit www.gradelevelreadingsuncoast.net.